It was a perfect summer Sunday afternoon, not too hot, not too cold – just right! Our active double date consisted of a thirty km (about 18 mile) bike ride and a picnic on the grounds of Royal Roads University in front of the National Historic site’s majestic Hately Castle. As I lay on my back, bare feet enjoying the fresh green blades of grass, soaking up the rays, I was suddenly in awe. Up in the brilliant blue sky something amazing was happening. In a circle surrounding the sun was a full on rainbow! 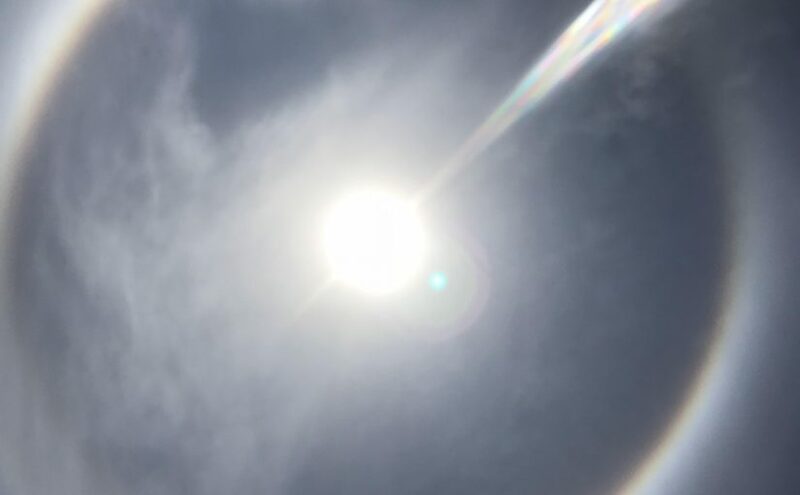 For the first time in my life, I saw a Sun Halo. Have you ever seen one? It was coolio!! A moment of gratitude for this amazing home we call earth. When is the last time you were Suddenly in Awe? Do you remember how it made you feel? Happy, appreciative, content? It doesn’t have to be a rare occurrence, it can be an everyday event. A beautiful flower, a glimpse of a hummingbird, a unique rock, unexpected laughter, a smell that brings back wonderful memories, turning on the tap and having hot water shower you, the meal prepared with love, the perfect throw of the Frisbee, the perfect catch! I could go on and on. But perhaps you could add to the list instead. What puts you in a state of awe, even just for a moment? A moment of appreciation, astonishment, wow-ness. If you can’t remember the last time you were Suddenly in Awe – wake up. Tap into your senses, open your eyes, listen, smell, touch, taste – then try it again. Really look. Really listen. Really smell. Really feel. Really taste. Awe is there, waiting to be discovered. Sometimes it’s obvious like the Sun Halo, but mostly it’s in a thousand little moments that will slip away unacknowledged as we stomp through our busy lives. It’s summer – what a perfect time for discovering! Being Suddenly in Awe, it’s just one more way to live Your Life, Unlimited. This entry was posted in Empowerment, Happiness, Newsletters, Personal Growth, Positivity and tagged e-news, happiness, Inspiration, personal growth, positvitiy, Stephanie Staples, Your Life Unlimited. Bookmark the permalink. Previous Previous post: Raise Your Hand! Next Next post: Start Where You Are!